This PDF 1.4 document has been generated by Adobe InDesign CS6 (Windows) / Adobe PDF Library 10.0.1, and has been sent on pdf-archive.com on 24/06/2015 at 14:35, from IP address 77.107.x.x. The current document download page has been viewed 339 times. File size: 3.9 MB (10 pages). vitamins, minerals, amino acids, enzymes and polysaccharide. ■■ A natural source of B vitamins, including B3 niacinamide. cardiac function, and a reduction in tiredness and fatigue. ■■ Vitamin C for collagen formation, bones, cartilage, teeth and skin. natural fresh flavour of aloe vera. 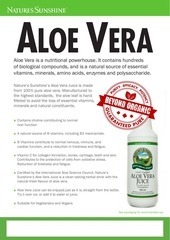 ■■ Aloe Vera Juice can be enjoyed just as it is, straight from the bottle. Try it over ice, or add it to water or juice. available only from Nature’s Sunshine. ■■ This unique combination contains Juniper Berries. potassium, sodium, vitamin A and riboflavin. there is a place for you here at NSPUK. NO EXPERIENCE - NO RISK! to the most effective ways of building a successful business, in a way that suits YOU. every step of the way, and we’ll make sure that you always have the guidance you need. earn, that’s up to you. International and European trips, cash rewards and monthly cash bonuses. structural system of strength and flexibility. Collagen formation, bones, cartilage, teeth and skin. multiplication of bacteria, fungi and viruses. Mix one teaspoonful (5ml) in up to 1 litre of water, three times daily. Do not mix with salt or salty liquids. colder, darker seasons of the year. standards using only the finest quality ingredients. 1000% of the EC RDA. your stomach, making it easier to digest. Recommendation: Take one or two capsules with a meal three times a day. This file has been shared by a user of PDF Archive. Document ID: 00283724.